It was this innocent comment left on a post about parallel universes that first pulled Rob Schwarz of Stranger Dimensions into one of the internet’s strangest theories. It involves The Berenstein Bears, a loving family of anthropomorphized bears who taught children life lessons via hundreds of picture books and two TV shows. But the problem is they aren’t The Berenstein Bears, they’re The Berenstain Bears. Though a startling number of people remember the name as BerenstEin, it’s in fact spelled BerenstAin, just like the authors Stan and Jan Berenstain. But is it possible that so many people are just wrong about the title? Back in 2012, blogger Reece offered up another explanation: Some of us have recently crossed over from a parallel universe. … at some time in the last 10 years or so, reality has been tampered with and history has been retroactively changed. The bears really were called the “BerenstEin Bears” when we were growing up, but now reality has been altered such that the name of the bears has been changed post hoc. Somehow, we have all undergone a π/2 phase change in all 4 dimensions so that we moved to the stAin hexadectant, while our counterparts moved to our hexadectant (stEin). They are standing around expressing their confusion about the “Berenstein Bears” and how they all remember “Berenstain Bears” on the covers growing up. 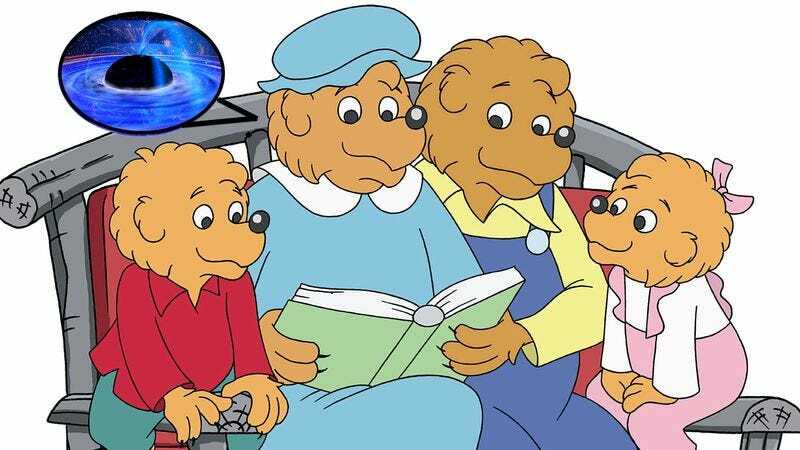 Those who remember the name as “Berenstain” are native to this “A” Universe, while those who are sure it’s “Berenstein” traveled over from the “E” Universe. Of course these “glitches in the Matrix” can also be explained another way: Human memory is faulty. But sometimes it’s easier for people to assume the whole universe is wrong rather than accept the idea that they might be. We at The A.V. Club know that all too well.